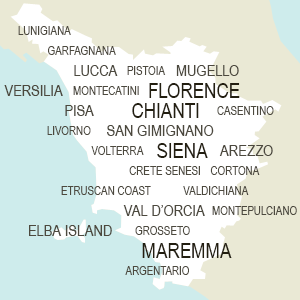 The Grosseto is in southern Tuscany in the area known as the Maremma. It forms and is the capital city for the province of Grosseto. The small historical center is surrounded by massive walls built by the Medici in the 16th century and which are still in very good conditions. While not high on the list of many visitor's itineraries, we do suggest visiting the small town and it's main Piazza Dante where you'll find Palazzo Comunale, the Palazzo Aldobrandeschi and the cathedral known as the Duomo, dedicated to San Lorenzo. The province of Grosseto offers many beautiful landscapes and destinations, many tied to the sea and its coast but many inland charming villages also dot the region and merit your time. Close to Grosseto, if you love history, we suggest a visit to the well-preserved archaeological area of Roselle, then spending a day of relax at the thermal baths of Saturnia (either outdoors in the waterfall or in the luxurious spa establishment), or heading to the towns of Castiglione della Pescaia and Sorano for some time along the coast and shopping. Grosseto offers a wide variety of places, something for everyone - read the more in detalied description on the right column to read more about what to see and do in Grosseto. This family-run relais is located 3 km from Pitigliano. It offers comfortable rooms and a relaxing thermal pool, as well as spa center. From the sea to its natural parks, from wine to cowboys, the almost flat land of Grosseto and the Maremma offer a bit of everything for everyone. Along the coast, the Natural Park of the Maremma offers a natural protected area between Talamone and Principina al Mare. The park offers the opportunity for visitors and families and groups to go on guided visits, as well as follow hiking paths that lead to the coast. Many of the beaches along this coast are far from parking lots, so only the most determined to reach them enjoy their beautiful views and sand. It is definitely a site for those who search for off the beaten track locations. If you or your children love marine animals, the Pelagos Sanctuary for Mediterranean and Marine Mammals is a protected area right off the Grosseto coast. Cetaceans may be often seen in this area, a marvelous experience you should not miss out on! The famous National Park of the Tuscan Archipelago, set amidst the Mediterranean sea just in front of the Tuscan coastline, also includes the group of small islands usually referred to as The Formiche di Grosseto (the ants of Grosseto) which are off the coast of the Natural Park of Maremma. This area is perfect for anyone who loves diving! Close to these little ants, you’ll find the more famous Monte Argentario, a promontory-peninsula located about 35 km south of Grosseto which we recommend for many reasons: the views, the sea and beacjes, the villages and summer events. Inland, head to Monte Amiata, a dormant volcano that offers many opportunities for trekking and biking in the summer, and becomes a skiing resort in the winter. On August 9th, for the celebrations of Saint Lawrence, the patron saint for Grosseto, you'll find a folklorist procession of butteri (local cowboys) and their horses going to the Duomo for the traditional blessing. The butteri are the shepherds in Maremma and for that reason are known as the cowboys in Maremma. The area of Maremma and the province of Grosseto is a very famous zone in Tuscany for their quality wines, several with the prestigious DOCG label. These include the Bianco di Pitigliano, a white wine produced in Pitigliano (the hilltop village is also commonly known as Little Jerusalem, with its ancient Synagogue) and the Morellino di Scansano, a noteworthy red wine we recommend you taste. If you’re keen on contemporary art, there are two destinations offering open air art exhibitions you should visit: the Tarot Garden in Capalbio and Daniel Spoerri’s Garden in Seggiano, close to Monte Amiata. Outdoor sculptures are set amidst the countryside, and in the second one, olive trees and walking trails are the enchanting setting for this international artist’s work. Both offer special destinations in Tuscany, where art perfectly blends with nature creating unique places to see and live!